Chocolate Caramel Chip Cheesecake: so rich & chocolate-y! 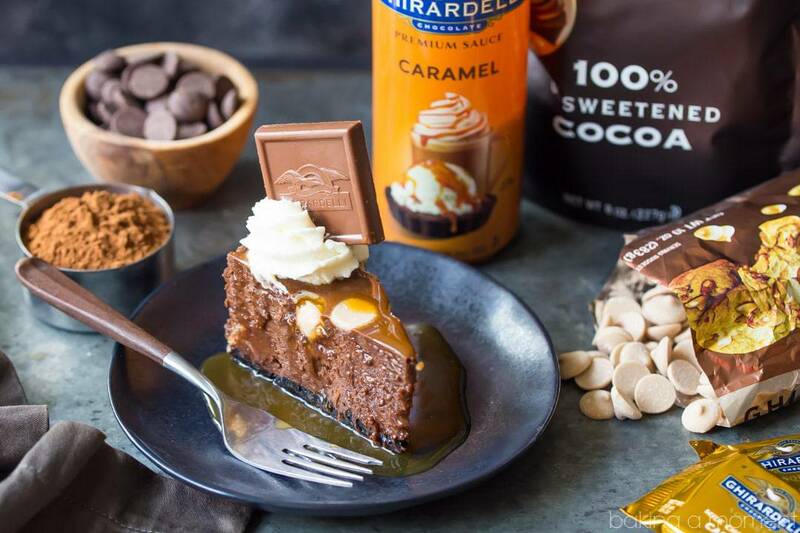 This chocolate caramel chip cheesecake is so rich, creamy, and chocolate-y, it’s almost like eating a candy bar! An easy yet impressive make-ahead dessert. Cheesecake, man. Is there anything better? I can’t think of another dessert that’s quite so irresistible. There’s something about that creamy, dreamy filling, and the crunchy cookie crust that just calls to me. Even better if there’s chocolate involved. Add caramel and I am completely powerless to its charms! 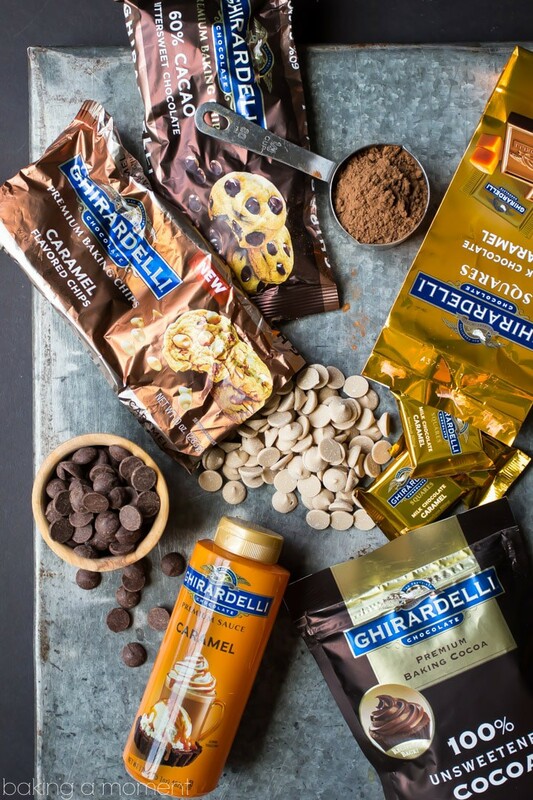 Have you heard about all the incredible new caramel products Ghirardelli has come out with? I was lucky enough to receive a sampling, and the minute I saw, I couldn’t wait to get into my kitchen and experiment. The end result was this magnificent chocolate caramel chip cheesecake. 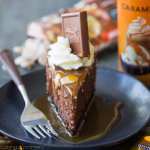 Here’s the rundown: rich chocolate cheesecake, speckled with creamy caramel chips, cradled in a crunchy cookie crust and topped with whipped cream and caramel sauce. Swoon! Can you even? 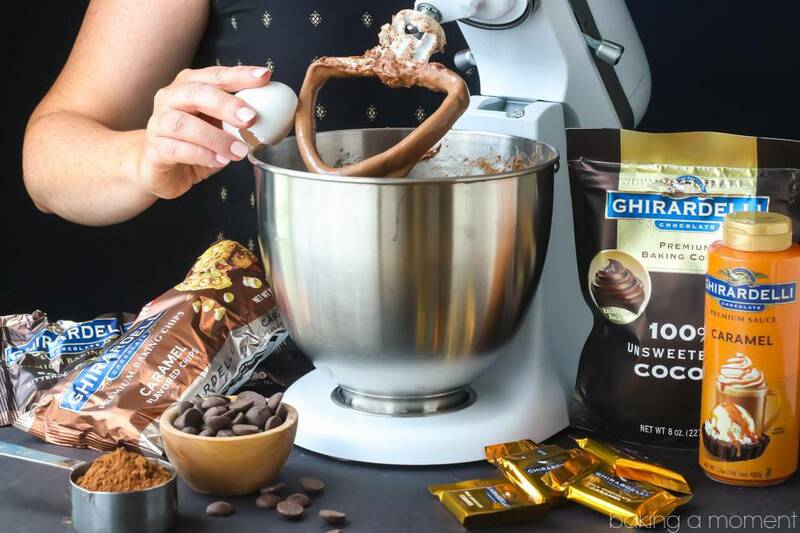 There are all the usual suspects: cream cheese, eggs, cream, etc., but for this recipe we are also using Ghirardelli Chocolate’s Premium Baking Cocoa, the new Caramel Flavored Baking Chips, and Caramel Sauce. 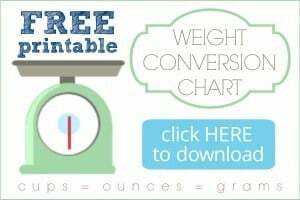 And it’s all inspired by my beloved Ghirardelli Chocolate Squares (the Milk Chocolate Caramel kind) that are one of my favorite little indulgences! 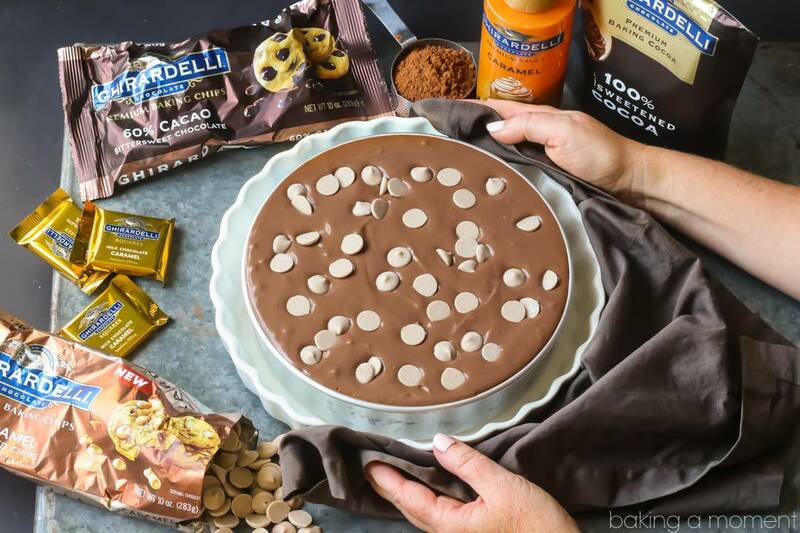 I’ve been baking with Ghirardelli products for years; I love them because they are easy enough to find on my regular grocery store shelf, yet the quality is so superior. The flavor is always so rich, deep, and intense, and it really makes your homemade desserts shine. One of the best things about cheesecake is that it’s easy, and it’s also a perfect make-ahead dessert. I like to bake it the day before I plan to serve it. That way it has plenty of time to chill in the fridge. Once the cheesecake is nice and cold, just cut it into slices and top with caramel sauce. If you want nice, clean cuts like you see here, run a sharp knife under hot water for a few seconds, then towel off before cutting. Repeat this after every slice, so that the knife always sinks in cleanly and your cuts are picture-perfect! 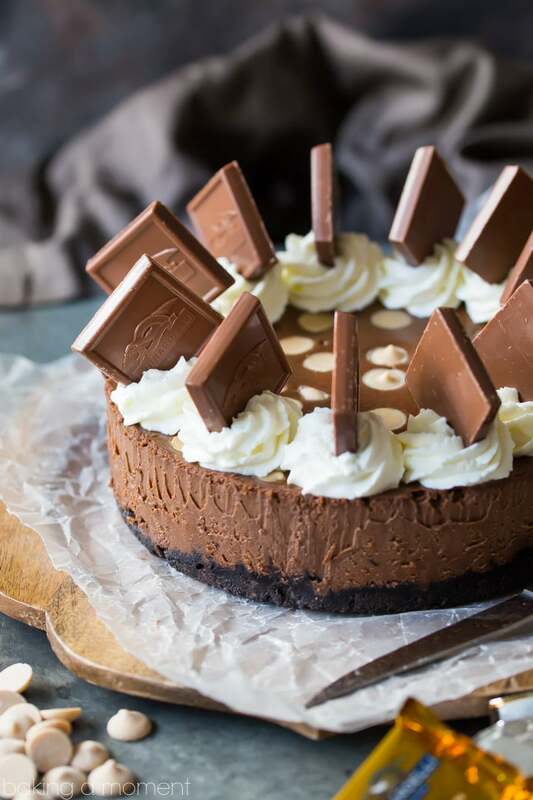 I think you and your family will really love this chocolate caramel chip cheesecake! 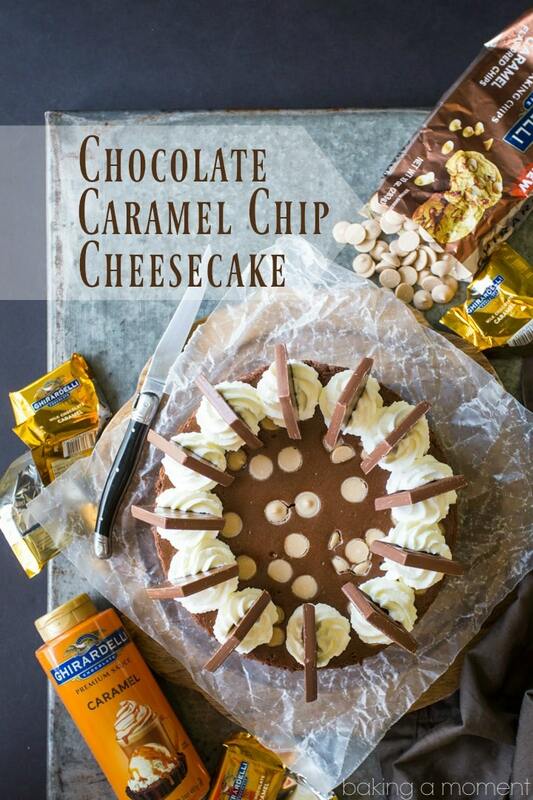 It’s definitely a crowd pleaser, with all that chocolate and caramel. I even like to top it with whipped cream, and garnish with a Milk Chocolate Caramel Square. So pretty and even more delish! Crush the chocolate sandwich cookies to fine crumbs with a food processor or mini-chopper. Add the melted butter and toss to combine. Place the sugar, cocoa, and salt in a large mixing bowl, and whisk to combine. Add the cream cheese, mixing on medium-low speed until combined. Add the eggs and yolks, one at a time, stopping to scrape the bottom and sides of the bowl with a silicone spatula after each addition. Stir in the cream, melted chocolate, and vanilla, and fold in the caramel flavored chips. Transfer the cheesecake batter to the prepared pan, and tap it sharply on the counter a few times, to eliminate any large air bubbles. Place the unbaked cheesecake in a larger baking dish, and pour very hot water into the larger dish until it comes up about 1-inch around the cheesecake pan. Bake for 20 minutes at 350 degrees F, then lower the oven temperature to 250 degrees F, and bake for another 65 minutes, or until set around the edges but still slightly jiggly towards the center. Turn off the oven, and prop the door open with a wooden spoon, allowing the cheesecake to cool slowly in the oven for at least an hour. Garnish with whipped cream, Caramel Sauce, and Milk Chocolate Caramel Squares. *Can also be made in a springform pan, but I prefer to use a regular cake pan to prevent leakage from the water bath. You can read more about that here. Most springform pans are 8 or 9 inches in diameter, so bear in mind that the cheesecake will come out thinner if you go that route. Holy Cow! Allie, this looks so scrumptious!! Thank you so much Tiffany! We have really been enjoying it. It’s great to hear from you! Swoon. This is exaccctly what I need to unwind after a long week- or a long day. Definitely need to try this! So happy you like it Karly! Thanks for the great feedback! Wow and wow! 🙂 Chocolate and caramel desserts are simply the best! I can’t argue with you there, Julia! So happy you like this! Is the water bath 100% necessary? Hey Nicole! I prefer to bake cheesecakes and other custards in a water bath just because it allows them to cook more gently and prevents cracking. I hope that’s helpful! It was definitely a big hit at my house! So happy you like it too Natalie! how can I keep a chocolate cookie crust, over night in fridge? Will it be just as good as if I made it all in one day? Hey Carol! I do it a lot- try just slipping your cheesecake pan into a plastic bag and it should be fine! Tastes every bit as good as if it was all made in one day.